The Symphony and Ireland project aims to examine the context and trajectory of the symphony in, and of, Ireland. The project was initiated with the discovery of the parts for the first-known symphony composed in Ireland, uncovered in the National Library of Ireland by RFMI/RISM Ireland researchers. 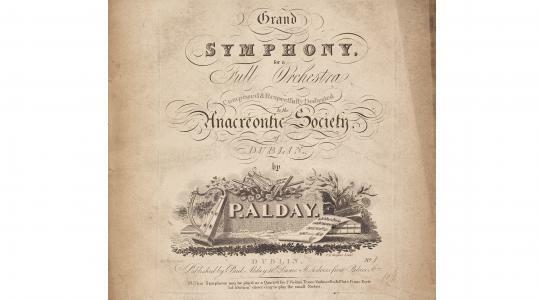 The symphony was composed in Dublin by the French composer Paul Alday c1816 and was one of two he wrote during this period. Prior to this discovery, the library of the Royal Irish Academy of Music held only incomplete parts, but the newly uncovered parts provided a complete set for performance. The parts were digitally transcribed parts by students of the DIT Conservatory of Music & Drama and on 20 April 2013 the symphony was performed by the DIT Camerata and accompanied by a symposium which brought together leading international academics and contemporary Irish symphonic composers to facilitate a contextual discourse on the composition and consumption of the genre in Ireland. The event attracted international press coverage and stimulated interest in this often over-looked area of Irish music history.